Every morning I’ve been practicing. Preparing myself for my next trip to the farm. I'm not sure if you've noticed, but, the farm has some intense scenery, and I want to drink it in completely when I’m there. In preparation, I find myself practicing mindfulness meditation. In particular, as I satisfy my need for nature, I practice walking meditations in my neighborhood. Walking meditations are exactly what they sound like. Meditations done while going for a walk. These are very common grounding meditations that are easy to do. Walking toward the hiking trails. Step 1. Go for a walk. Believe it or not, you can do this with a friend or with your dog. But if you’re feeling especially scatter-brained, I recommend walking by yourself to start. Step 2. Practice being present. As you walk, observe all the different inputs you receive both internally and externally. Avoid assigning any meaning to anything. Just watch. What do see, feel, or smell? What thoughts come and go? If you're with a friend, stay engaged. If you choose to have a conversation, stay mindful of what is being said and how you're reacting to the interaction. Observe the scenery around you and yourself within the scenery. Keep in mind, there is no right or wrong to this practice, just walk. Step 3. Bonus Step: Noting and Labeling. Noting and labeling is a mindfulness technique I sprinkle into my walking meditations. It's an engaging technique and especially useful for beginners. Here's how it works: As you're walking make a note of something you notice, and label it twice. For example, if you think a thought about your to-do list while walking, internally label and repeat to yourself something like, “Thinking, thinking.” Likewise, If you feel a cool breeze, internally note, “Coolness, coolness.” If you trip on a rock, internally repeat, "tripping, tripping." If your dog pulls you to a tree, think, "Pulling, pulling." This isn’t an exact science. Keep it simple. Remember that the point of this exercise is to understand that the only reality, is the reality of now. Go ahead and give yourself a boost by noting and labeling this exercise as, "Happy, happy." Cows wander around StarHill Farms. My time doing walking meditations has made a real difference to me. It's helped me realize what “present” looks like. In fact, I've found how to deepen that sense of presence by holding myself in moments a little longer than one is naturally inclined. Those seemingly endless to-do lists stop running in my mind, as I come back to my natural guideposts — the ins and outs of my breath, the familiar cadence of my feet as I walk, and the gentle tug from my dog on his leash. 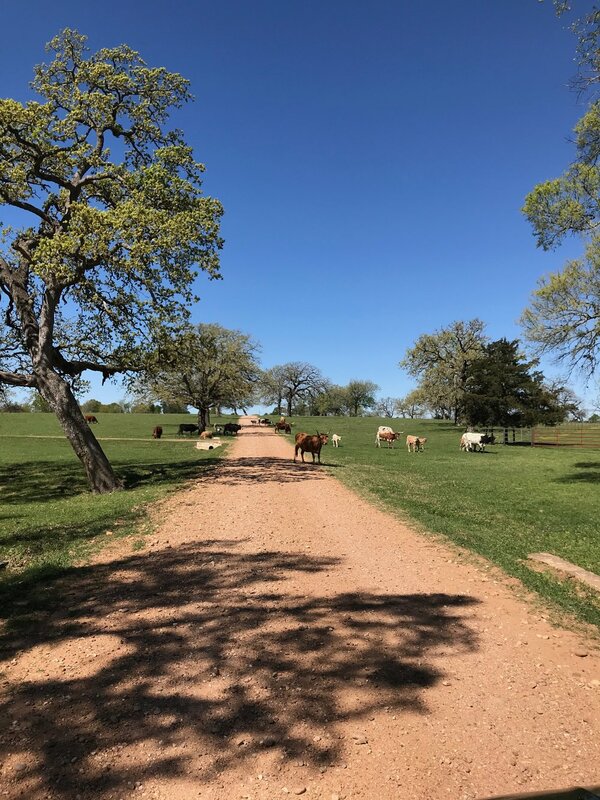 When I travel to the farm, I do my walking meditation and gratefully consume the uniquely enhanced landscape, a complete departure from my usual city atmosphere. 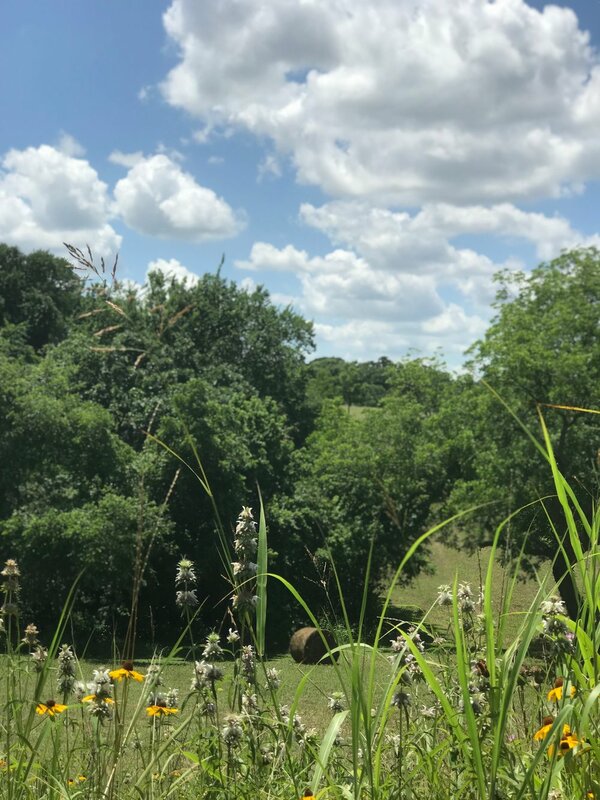 At StarHill, the walks fill with the colors of native Texas flowers, the warm hues of wood on quintessential log cabins, and the earthy aroma of cedar. I see horses playing by Hinze Cabin and watch the windmill twirl in the breeze beside the pond. I say hello to the cows passing by (perhaps on their own walking meditation) with calves in tow. I take it all in. I get grounded. I enjoy the moment. "Happy, happy."